Ah, one of my least favorite office expressions. Another one would be “circle back,” which would also fit in with this post, as plates are generally round. But I digress. It’s time for the plate wall reveal! When Taylor and I moved in, we had this large side wall to the left of the bed that was wide open. I knew I wanted to do a plate wall, but with what plates? We both love Kelly Wearstler‘s plate wall at the Viceroy in Santa Monica, so we kept that in mind as our inspiration. Even though Ms. Wearstler mixes in some print/color, we wanted to keep it relatively monochromatic. So, I started buying white plates of different sizes when I found some that were interesting at places like Homegoods, TJ Maxx and Tuesday Morning. Only thing is, they were pretty blah and not doing a whole lot for either of us. I did find a cool gray/white peacock plate at Anthropologie that survived the return cycle and now lives in the Living Room. And then, we totally lucked out. Taylor’s Dad gave his daughter Sadie some antique Spode china that was his mother’s (maybe grandmother’s?). It’s white with an eyelet pattern and is completely beautiful. It has so many sizes–what do you use a 3″ round plate for, anyway?–and it worked perfectly for what we wanted. And since 12-year-old girls have very little use for fine china, Sadie graciously allowed the collection to live with us for a decade or two. Here, you can see some of the gorgeous detail of the china. So, we got to work recreating the Viceroy layout with our dishes and dimensions. It’s really artfully done, as the plates are not on a grid. 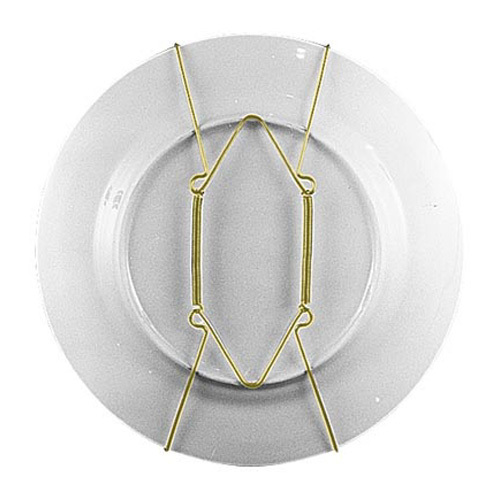 In fact, there are only 2 straight lines of plates in her whole design. Taylor took over the dining room table and a little later, we had our pattern. It was a happy accident, but we loved how much they popped off the dark brown and we knew our pale gray walls would not yield the same effect. So, the idea of an accent wall was born. We hightailed it to Home Depot with the floral Ralph Lauren pillow sham you can barely see in the first photo to match a color. The winner was Behr’s Bitter Chocolate. Ok. So now, how do we hang these suckers? I didn’t want to use those wire plate hangers, because you’d see the wire hooks on each plate. Yuck. So after a bit of searching on Amazon, I came across these. Very British, you know. They’re basically canvas circles with glue on the back that you moisten and adhere to the back of the plate. They come in all different sizes. I ordered up when a plate was on the border, but Taylor ended up trimming some down to fit the circle on the back of the plate. If we wanted to remove them, all we’d have to do is soak them in hot water. I feel like they are very secure. My only hesitation would be if these plates were hanging in a high traffic area where someone might brush them with their shoulder. In that case I would hang them on picture hooks, vs. nails,which is what we used. Then (and when I say “then,” I mean, “4 weeks later.”) we used our handy dandy kraft paper trick to position the plates. First we traced them (and when I say “we,” I mean, “Taylor.”) and then measured from the top of the plate to the top of the hanger, then marked that distance on the paper. Then we taped the paper to the wall. Lesson learned, make sure the top of the paper is a straight edge to make leveling a bit easier. I whipped out my iPhone level app to make sure we were on track, though. Taylor started nailing and we hung plates as we went to make sure our spacing stayed true. We had to move a plate a smidge here or there, but I think we only ended up with 2 extra nail holes. Not too shabby. And our relationship stayed intact, which was the larger worry, as these kind of things can usually spark a “you’re doing it wrong” kind of fight. We are super in love with the way it turned out. I wasn’t sure how I’d feel about the accent wall, but it really helps the room. Especially since we went a bit light with the gray color in the first place. I upgraded our Ikea duvet to a new one from Dillard’s(of all places) that was on sale (even cheaper now than when I bought it) and fit the Wearstler vibe pretty well, if I do say so myself. So what do you think? Plates in the bedroom too weird? Have a good story about almost strangling your roomie or significant other during a home improvement project? Lemme know. It occurred to me while reading this that the plate wall was a very similar project to the picture wall in our old apartment. You should post that if you can find a pic of it. I always thought it was pretty cool. Maybe it needs to be recreated over our living room sofa. As for home projects and anger management, I’d say my flat file has caused more grief than any of our actual projects. Unless poison ivy counts as a project nemesis. Hmm. I lost a lot of my pics when my computer was stolen. Off the top of my head, I think there is a shot of Leslie and I dancing to “Party in the USA” that we used in our 2009 year-end video. Do you have it? A plate project has always been on my list too. You guys rocked it! It looks absolutely fantastic! it look SOOOOOOO good. i love it! I finally got a chance to stop by your blog and read a few posts today. LOVE the plate wall! Can I hire you for my new house? Just got back from Hawaii and am overwhelmed already. I will pay you in soup and wine. I love this!! I have some plates from my grandmother and aunt, this would be perfect. And I love the plate holder- have used the wire before, unattractive. Thanks for the inspiration.